Even savvy entrepreneurs run into pitfalls when it comes to their business expenses. 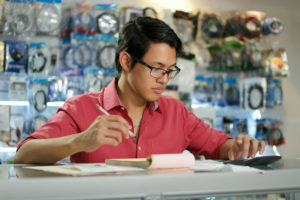 Workers, facilities, supplies, taxes, insurance, marketing, and other costly small business challenges can add up fast. But there are a lot of ways to cut costs in business without compromising on quality. We’ve compiled a list of 10 small business cost-cutting strategies that may help reduce small business expenses and inspire you to think a little differently about your finances. You may have done this when you first opened your business but it can never hurt to check in. Make sure to include every single expense and keep track of your spending carefully. Review your budget frequently (weekly or monthly) to make sure that spending is what you expected. That way, you’ll catch problems early. Credit cards can be helpful but use them cautiously. They can cause you to rack up bills without realizing and make it easy to push off payments. In the long run, that leads to higher spending and debt. You may be surprised how much you spend on stationery, printer ink, and office supplies of all kinds. But switching to email invoicing, online record keeping, and intra-office email communication can all lead to serious small business expense reduction. Ask other people in your particular field for their recommendations. There is a huge range of prices out there for services like banking, phone service, internet, insurance, etc. For some businesses, these may be the major portion of your expenses. That’s why it’s very important to compare costs and ask a lot of questions about what you’re getting for your money. Resist the temptation to get bowled over by salespeople – you don’t want to pay for features you’re not going to use. The best commercial insurance for small business is not a one-size-fits-all policy. Instead, try to find a less expensive tailored small business insurance policy that will help your specific business grow. This is an ongoing process. To keep your business cost reduction strategy going, check in with these service providers once or twice a year and make sure you are still getting the lowest rates available. Word-of-mouth has always been the best possible marketing method and now social media lets you kick it up a notch with minimal spending. You don’t need to switch to completely online, but do a serious calculation: how much is your traditional advertising actual bringing in and how much does it cost? It might be time to take a serious look at resources like Facebook, Instagram and others. Resist the temptation to squeeze your employees – you’ll just end up paying more to recruit and train new people when your best employees leave. Instead, consider offering them the chance to learn and implement new skills using sites like Lynda and Coursera. They’ll get exciting new challenges, build their resumes, and expand their responsibilities, and you’ll make the most of your resources. Time is money and being more efficient is one of the best ways to reduce costs in business. Cut down on wasted time by making sure your team communications are clear. Have clearly defined goals for each employee and make sure you’re giving high-quality, constructive feedback. The better the communication within the team, the less time and money wasted. Suppliers and local organizations of all kinds may offer business savings programs. For example, Staples and Office Depot both have discount programs and you may be able to get discounts from local businesses through your chamber of commerce. Set a schedule to look at your finances and figure out exactly which products and services bring in the most money. You can do this weekly, monthly, or every quarter, whatever works for you. Limiting yourself to your core business can be one of the most effective cost reduction strategies. We mean this literally. Look at what supplies are piling up and rethink your inventory. Start considering your space itself with an eye toward business cost reduction. If you have an office, consider whether you can get by with a smaller office, maybe by getting rid of junk or by encouraging employees to telecommute. These cost-cutting measures for business are just a few cost reduction strategies out there. Hopefully, they’ll inspire you to delve deep into your spending and think outside the box.